Oh boy! Was this a fun project.. our 1975 Argosy! 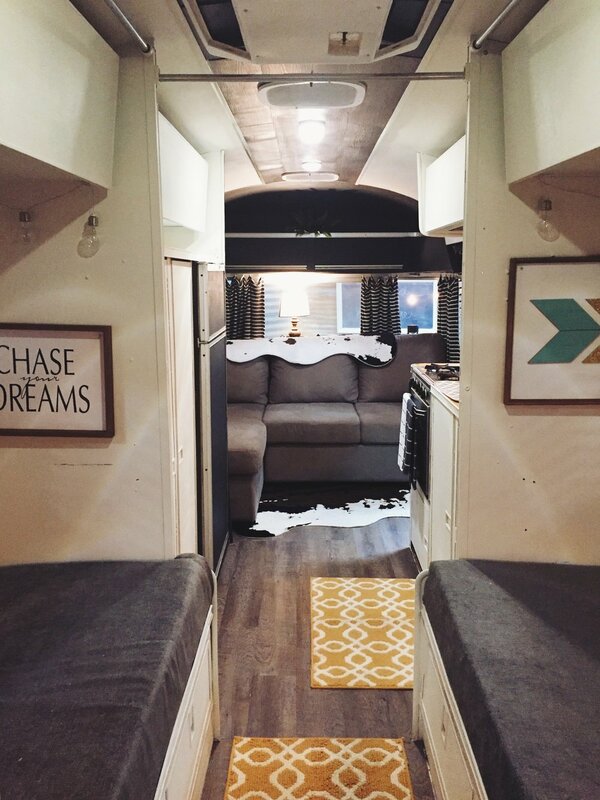 I have always been wanting an Airstream. For a few years now I have been redoing vintage can hams... which are so cute! They're just a little small for a family of 4 with 3 dogs. Woof! Over the summer I was really wanting one... the hubby told me if I find one for the right price (under $3000) he said we can get one! Well, he thought that would never happen... hahaha! I joined a couple of Facebook pages just for Vintage Trailer Sales that lead me to an Airstream Forum. It only took me two weeks to find this baby! I know she doesn't look very pretty, but I can see past all that to see the beauty. I contacted the owner and the Argosy was still available... in Maple Valley, Washington! I told the hubby we were leaving the next morning to go check her out... he gave me that look as to yeah right. It's only a 5 hour drive from Idaho! He said "How much?" I went on to explain that I have always wanted an Airstream and that the owner said everything worked. Again, "How much?" I know he thought I would never find one under the price.. but, then again I am a junker! I said "Get everything ready to bring her home because she was only $2500!" My poor hubby can never win against me! The next morning we set off to Maple Valley, Washington! We arrived around 11am. The poor Argosy was sitting in a field unwanted for 10 years. I was a little scared because the hubby had this look that said we drove all this way for this! She had weeds growing up and all around her.. some rodents took housing inside, and it didn't have everything (missing the dinning area and carpet). He was even saying.."I am not sure about this one." Of course I am lets talk to the owner about what their plan was for her. She said her son was living in it and was trying to fix it up. She wasn't sure if she was ready to sell because her son had passed about 10 years ago. We asked how old her son was... 19. My husband and I looked at each other and said "We will take it!" Most of you know that our son passed last December and he was 19 years old. We hugged and cried. This was meant to be! After a few fails (not the right hook up for lights or brakes and getting a trip permit) the day was fading fast and we didn't want to spend the night. The hubby was about to give up! Of course I am not that person who gives up easily. I was like lets give it one more try... that one last try to get her out of the spot she was in hoping the axle and tires were ok enough to drive her home. It worked! Now, what? We drove to the nearest auto parts store! Bought some clip on lights so that we can drive her home to Idaho. We made it back and she towed like a DREAM. After, we were home for a few days she had a bath! This is what she looked like after we cleaned her up. Everything was taken apart to reach every nook and cranny... we didn't want any surprises! Next, was her much needed manicure and pedicure! Our friend Matt helped us out! He found the best paint from Sherwin and Williams. Dries fast and leaves a nice hard coat. After all that we tackled the inside! This took us a few weeks... and after looking through everything that was left in the trailer we found almost everything that was missing. Still no sofa! We knew that was gone... haha! It didn't take us long to find one that would work for not a whole lot of money. Costco to the rescue! We found this great sofa that is a hide-a-bed too. So, I bought it! It would fit perfectly... well, almost. 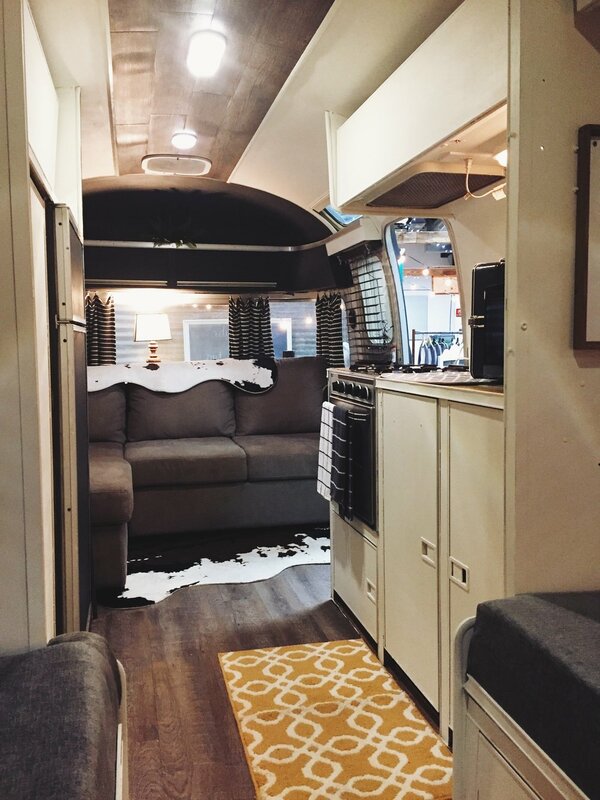 See Airstreams are rounded and the measurements toward the floor are more narrow then the middle. We measured the middle... think think think! Ok.. idea came to mind. Lets take off one of the side arms, but if we do that we can't take it back if it doesn't work. hmmm... oh well, we can use it in the basement of our house if it doesn't work! It did work! After all the painting, laying new flooring, making new cushions and decorating this is what we have so far. We are still working on some water line issues but WE LOVE IT! We still haven't named her... Comment and let us know what she should be called?